Consultation: Before the actual dental implant treatment can begin, a consultation will be scheduled. This consultation is required to determine if the patient is a good candidate for treatment. The majority of patients are good candidates for dental implants. Even patients with pre-existing medical conditions, oral health problems, or bone loss can often undergo implant treatment provided that certain precautions are taken. This initial consultation will allow Dr. Gopin to examine the teeth, gums, and jaws and create an appropriate treatment plan. Bone grafting (optional): A small percentage of patients may require a bone grafting procedure before implants can be placed. Bone grafting allows Dr. Gopin to take healthy bone from one area of the body and place it into the jaw so that it is dense enough to support the dental implants. Implant placement: The actual implant procedure will begin with the surgical implantation of the dental implant into the jaw bone. Dr. Gopin will make a small hole through the gum and jaw bone through which he can insert the titanium screw that is known as the dental implant. Once the implant is in place, the gums will be closed with sutures. Osseointegration: Once the implants have been placed, the patient will be given ample time to heal before treatment proceeds. It can take anywhere from three to six months for the gums to heal and for the dental implants to fuse with the jaw bone, a process known as osseointegration. This healing time is very important to the ultimate success of implant treatment. Abutment placement: Once osseointegration has occurred, a second surgery will be scheduled in order to place the abutments. The abutments are metal posts that extend above the gum line to attach to dental restorations. At this appointment, molds will be made so that final dental restorations can be fabricated. Temporary crowns will be placed at this appointment so that patients can begin to experience the benefits of their new smile. Restoration placement: Once the permanent dental restorations are complete, the patient will return so that these restorations can be cemented into place. 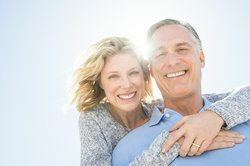 With the restorations secure, patients can enjoy the full benefits of dental implants treatment. From beginning to end, dental implants treatment can be somewhat lengthy. However, the benefits of dental implants treatment are many and the results should last for years to come. If you would like to learn more about the dental implants treatment timeline, we invite you to contact us with any questions. Dr. Bruce Gopin is happy to provide you with more information and can help you determine if dental implants are right for you.